Most publications about rabbits have some information about housing but the material is often so general that it is of little practical use. That information also often omits many of the important "hows" and "whys" that are learned through experience which is a difficult and expensive way to learn. In order to provide more comprehensive information for rabbit owners and producers, James McNitt, Ph.D., researcher at the Southern University Ag Center and animal science professor at Southern University and A&M College, has published a Practical Rabbit Housing Manual. This publication brings together information on rabbit housing and includes the reasons why certain designs, materials, or methods are favored by rabbit raisers. This information is especially important when the preferred method is more expensive or more difficult than an alternative method. For more information, contact McNitt at james_mcnitt@suagcenter.com or (225) 771-2242. For two consecutive days, Southern University Ag Center's Livestock Show was the talk of two local media outlets in Baton Rouge. WAFB Channel 9 announced the event Thursday and WRKF 89.3FM (Louisiana's National Public Radio station) launch the Friday morning Jim Engster Show with the activities of the 66th annual show. Dr. Renita Marshall, livestock programs director and assistant professor, was interviewed by both stations and the Louisiana Agri-News Network which is a radio news network for farmers. The later segment will air next week. Announcements of the show are also appearing on local websites, community calendars, and community newspapers. Congratulations Dr. Marshall for great interviews. Congratulations also to the Livestock Show team Christie Monroe, Brenda DeRouen, Joyce Tubbs, and Lisa Gray for their hardwork preparing for next week's activities. Land owners and farmers who are interested in expanding or diversifying their land can learn about incentive programs available from the federal government by watching "Cash for Conservation," a new video produced by the Southern University Ag Center. Researcher LaShunda Anderson, Ph.D., leads the Center's Wildlife Habitat and Native Grasses Outreach Project which educates land owners about these opportunities. Let the Quiz Bowl Begin! Farms Conference. Shreveport farmer Jonathan Jackson credited LSU and Southern University ag centers and our agents for continued assistance throughout his farming career. Individuals, potential and existing business owners who are contractors, or non-profits in small towns and municipalities can learn how to contract with the state of Louisiana, federal agencies and other businesses at the Center for Rural and Small Business Development's fifth annual Connecting Businesses with Contracts Procurement Opportunities Conference, Tuesday, March 24 in the Cotillion Ballroom of the Smith-Brown Memorial Union. Workshops begin at 9 a.m. with topics on successfully managing your business, improving presentation and marketing skills, and contracting with others. Several of the sessions will be held concurrently but will be repeated in order to allow participants to attend all sessions. Shaw Group vice president Matthew Butler will be the luncheon keynote speaker. Online registration at www.http://www.crsbd.com/events/registration/ is required to attend this free conference. Representatives from the U.S. Small Business Administration will discuss its SBA programs, guarantees, certification process, bonds and surety and GO and disaster loans. The Louisiana State Contracting and Licensing Department will have representatives available to assist conference attendees who want to become licensed, or who are already licensed but want to increase their knowledge. Other sponsors for the conference are Southern University Ag Center, the Louisiana Economic Development Corporation, Louisiana Small Business Development Centers in Baton Rouge and Lafayette, the U.S. Small Business Administration, Louisiana State Licensing Board for Contractors and the Louisiana Procurement Technical Assistance Center. Exhibitors for the conference include: Shaw Environmental Infrastructure Group, Entergy Corporation, U.S. Army, New Orleans District Corps of Engineers; FEMA; USDA Rural Development; Textron Marine and Land; Ameriplan; Operation Hope; Alcatec, LLC; Louisiana National Guard; Department of the Navy; Louisiana State Office of Purchasing; Baton Rouge City Purchasing; Today’s Money Makers; Louisiana Secretary of State Office; Small Business Transportation Resource Center/U.S. DOT; Brown and Brown Insurance, Picerne Military Housing, CAMTRACO and others. WAFB-TV 9 Sundays at 5 a.m.
KPBN-CH. 22 Monday-Thursday at 9 a.m.
COX 4 Saturdays and Sundays at 9 a.m.
KATC-TV3 Sundays at 6:30 a.m.
KALB-TV5 Saturdays at 5:35 a.m.
KPXJ UPN 21 Saturdays at 5 a.m.
KPLC Saturdays at 5:30 a.m.
KNOE-TV Sundays at 5:30 p.m.
KDCG-TV 22 Tuesdays and Thursdays at 6:30 a.m.
For more information on this project contact Renita Marshall, DVM, Owusu Bandele, Ph.D., Dawn Patin Ph.D., or LaShounda Anderson Ph.D. at 225-771-2242. The Southern University Ag Center is hosting a free seminar for landowners on the economic impact of native grass and wildlife in Louisiana. Dr. Lashunda Anderson will share information on using land as an easy source of residual income. Anderson, an agronomist, is project director of the Center’s Wildlife and Native Grass Outreach Project. She will share information on conservation, native grasses, federal incentive programs for landowners, and alternative agricultural practices with environmental benefits. Landowners can also learn about growing a habitat for wildlife. OPELOUSAS— In observance of Black History Month, the Southwest Center for Rural Initiatives is hosting “We Are the Ones We've Been Waiting For," an educational presentation Thursday, February 26, 2009 at the LSU/SU Agricultural Extension Office (1065 Highway 749, Suite A in Opelousas). The 6pm program is free and open to the public. Southern University Agricultural Research and Extension Center horticulturist Owusu Bandele, Ph.D., will profile three dynamic African-American trailblazers and grassroots leaders: the Reverend John H. Scott, a farmer who courageously led a voter registration campaign in Lake Providence, Louisiana; Mr. Wilbert Guillory, founder of the Zydeco Music Festival, farmer coops and many other notable accomplishments; and Leonard Julien, inventor of the sugar planting machine, musician, and local leader. These rural leaders have roots in agriculture and represents different parts of the State of Louisiana. For more information, contact the Southern University Ag Center’s Southwest Center for Rural Initiatives at (337) 943-2410 or Keydron Guinn,Ph.D., rural sociologist, at keydron_guinn@suagcenter.com. Young farmers and ranchers from across the state are gearing up for the 66th Annual State Livestock and Poultry Show hosted by the Southern University Agricultural Research and Extension Center. They are grooming, weighing, and even breeding their champion animals in preparation for the February 27-28 competition to be held at the Maurice A. Edmond Livestock Show Arena on James C. Archie Drive in Baker off of Highway 61N. School groups and families are invited to attend this free event. Prize meats (beef, lamb, pork, and goat) are available for sale. "This culminating event not only showcases the showmanship of Louisiana's young herdsmen, it also shows the hardwork, dedication, and financial investments they and their families have made in raising the livestock," said Renita Marshall, DVM, livestock show programs director. According to Marshall, proceeds from the meat sales go directly to the youth. The show features animals that have been showcased or have won in parish competitions. During the two-day event, judges will name the state champions in various breeds of beef and dairy cattle, hogs, sheep, lamb, and goats. The all-time favorite mini-farm, featuring a variety of small farm animals, will open Friday, February 27, 9 am. Tour guides will discuss different animals, their food sources, farming and how agriculture affects everyone's lives. The show will also have livestock and poultry quiz bowl, face painting, food, craft booths, and the Hall of Louisiana Agriculture, until 1 pm Friday for local school groups. The Southern University Ag Center has hosted the competition as a means to "develop champion youth," said chancellor Leodrey Williams. 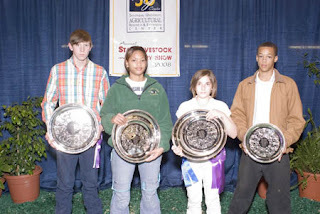 Youth, age seven to 19, whose animals successfully weigh-in will be judged on showmanship and the animal's grooming. Winners will receive premiums, rosettes, ribbons, and silver platters. An awards presentation for exhibitors of champion market animals in the show will be held Saturday, February 28, at 8 am and will be immediately followed by the Junior Auction Sale at 10:30 am. Meat buyers, who have not pre-purchased their meat, will be on hand to bid for show livestock meat.